This is a great concise guide from 1-5 years old. It synthesizes really well all the pertinent information you need to know as a parent. Subjects range from growth charts to vaccinations to challenging behaviours, twin care and much more. But what I love mostly about this book is that it is written for Canadians. Most parenting books I came across would be written based on American standards, laws and regulations. Not this one! It is written by the Chief of the Paediatric Medicine Division of the Hospital for Sick Children. 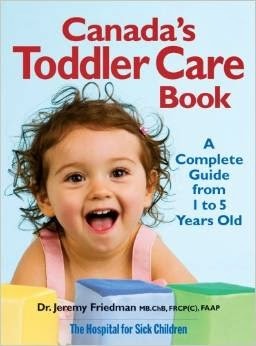 It contains great references such as CDC growth charts, a quick guide to all the developmental milestones 0-24 months, detailed description of each vaccination given, teething patterns (eruption patterns), and much more!